Scoop 6 (1/2-cup) balls of ice cream onto cookie sheet. Freeze 15 minutes. Meanwhile, place cereal in shallow pan. Drizzle 2 tablespoons of the honey evenly over cereal; mix well with fork until crumbly. Quickly roll 1 ball of ice cream at a time in cereal mixture to coat; return to cookie sheet. Freeze ice cream balls until firm, about 20 minutes. (If desired, cover and freeze until serving time). In small microwavable bowl, microwave remaining 2 tablespoons honey, uncovered, on High 20 to 30 seconds or until warm. 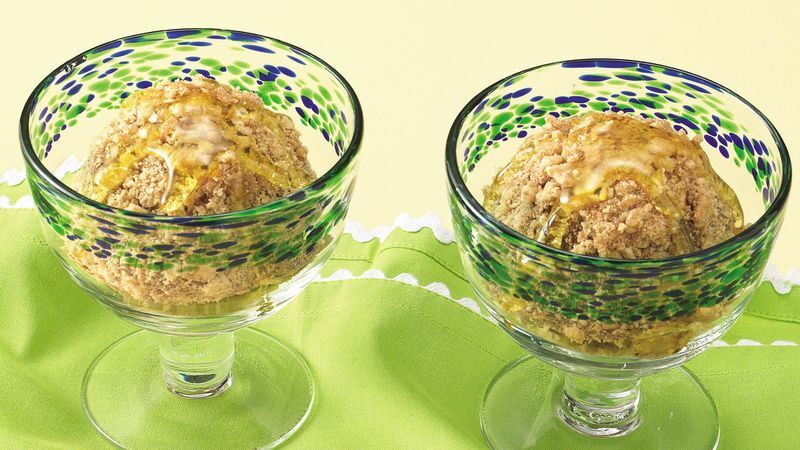 To serve, place ice cream balls in individual dessert dishes; drizzle each with 1 teaspoon warm honey. Perfect for company, this fun frozen dessert can be prepared several days in advance.